Here are some comments from her students about Lyn and her classes. "Lyn is an incredible quilter and an even better teacher. I love her classes and making her quilts because the designs are innovative and beautiful. I feel we are lucky to have her as our "local" teacher!" "How lucky I was to have taken my "first learning to quilt" classes from Lyn 12 years ago. She shares all the best, safest, fastest new and old techniques. Every Mystery class will awe you with one of her designs. Lyn is the "quilt Designer and Teacher of/for the 21st century. "Lyn has been a teacher at Tahoe Paradise Quilting Retreats for the past 5 years, and will be the featured teacher at the Sierra Mountain Retreat at Historic Strawberry Lodge in May, 2004. Lyn's retreats are wildly popular, and fill very quickly. There is almost always a waiting list from one year to another. Her classes are known to produce original, eye-catching quilts. People come back year after year to create her appealing designs. In my view, Lyn's original designs are set apart from most other designs because hers look difficult, but aren't once she shows you the "trick". And there is always a trick." "Although I have not been able to take many of Lyn's classes, I have had the honor to quilt many of her quilts and those of her students. 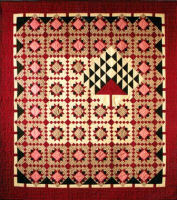 Her designs are a quilting challenge as the blocks most always form different eye catching designs. I have enjoyed Lyn as a teacher and have really appreciated her "slick tricks" for completing a quilt with accurate piecing." "Lyn is a very inspiring and challenging teacher. You can always look forward to a new twist or turn in each of her designs. It is always amazing to see one of Lyn's designs in several different color combinations. They look like entirely different quilts sometimes. Lyn also challenges everyone to try some of those "ugly" fabrics and realize just how wonderful they can be in the right setting. She can really get your creative ideas going." "I’ve been taking classes from Lyn regularly since I became a quilter in 1999. I tell everyone considering taking a class from her not to shy away because the quilts look too difficult. She teaches creative ways to piece her original designs that look harder than they are to accomplish. I always learn so much from her while having a great time at class."